Things we did today...: Movin' On To BOCA! Yachts as big as homes or homes as big as yachts? The Las Olas Marina opened at 8 am. We called them and were told to just pick a slip. The wind was clam and there wasn’t much current to speak of, so it was an easy docking in the enormous slip. There are pump outs at each slip and they’re self serve. I topped off the water tanks while Bruce got us set up to pump out the waste. This was a luxury as it allowed us to give our tanks a much needed fresh water flush. We took our time and got it done right and feeling fresh as a summer’s breeze, we quietly slipped out of Ft. Lauderdale while it was just awakening. The gorgeous homes of Ft. Lauderdale with their equally gorgeous yachts gave way to a more eclectic mix of excess and modesty. There were still enormous homes along the way, but there were more and more homes that looked as if they have been there since more simpler times. Old homes that may have once demonstrated opulence, but on a different scale. We continued on the beautiful green waters. I am learning once again that whatever my expectations of a place are… they will be wrong. 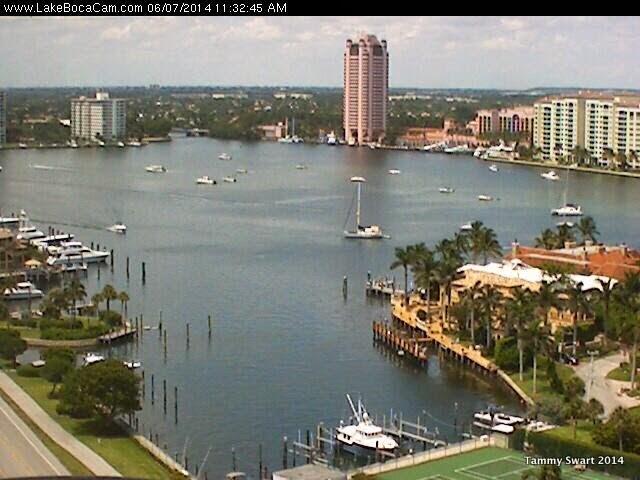 Surely this is true of my expectations of Lake Boca Raton. My smile grew as I realized that this pretty spot was our stop for the night. Arriving early on a Friday, we picked our spot among the few boats already anchored and put our anchor down with the smiles never leaving our faces. In our haste, we plunged in with only one thing missing… but wait! Bruce to the rescue. We discussed our situation while luxuriating in cool splendor. Maybe we really DON’T need to rush off in the morning. Maybe we’ll just decide then..
Let the weekend commence! After a soft sunrise in our eerily quiet lake, we began to realize that if the winds remained as they were, we would be hanging out into what serves as a channel for boats entering and departing the inlet. There was a much more desirable spot a short distance away. We moved the boat and re-anchored, feeling much more secure. I guess we’re not going anywhere… we put up our sunshade and spent the day watching our neighbors arrive and depart. That's US just right of center in the webcam pic! Evidently I became remiss in my photographic responsibilities while relaxing… The only proof of the debauchery that occurred is some poor resolution pics taken with the iPad. Perhaps Karma took it upon herself to smite Bruce for this… Perhaps it was an unconscious punishment on my part by means of overcooking the pork loin for our dinner… Whichever it was, he was stricken by a painful case of hiccoughs after dinner. This progressed into a nightmare that lasted into the dawn. His esophagus constricted on a piece, or pieces of meat, causing him pain, hiccoughs and the inability to swallow. This progressed with his attempts to sip water, to mass production of phlegm and more pain. Long story short, we tried everything we could find on the internet to alleviate the spasms, including accupressure, walking, head between the knees, and panic. The options were not good. We could try to find a place to dinghy ashore and hope that our dinghy was still there when we returned… take a cab to the ER on a Saturday night, where we would wait forever for attention… or we could wait it out here on the boat. He was able to breathe. So we opted to wait until dawn, then decide. Maybe get some help with shore access from the local water police. After a seemingly endless night where we were both only able to fitfully doze, dawn arrived. With it, the passing of his malady. He was suddenly able to swallow water. No need to seek medical attention. We went back to sleep. Sunday morning was spent napping and babying Bruce’s tender esophagus. He was exhausted but in no pain. After his second nap, he rallied and our stay in Boca Lake returned to normal with a dinghy ride. We made our way across the shallow sand bar where all the smaller boats were anchored. The water grew more and more green and clear as we neared the bridge crossing the inlet. The current was raging with the incoming tide. Boats buzzed in and out causing quite a chop on the water. We bounced around causing me to giggle with glee. This place was just so pretty! With the incoming tide, our passage through the very narrow bridge seemed like the thing to do. The water was almost violet tinted it was so blue… We rode the waves back into our calm anchorage and motored back through the field of families all enjoying their cloudy day as if oblivious to the possibility of impending doom. Gone were the bare breasted women. In their place were sweet families frolicking with one another. Skinny kids jumped from cabin tops and flipped off of floating tables. It was people watching at it’s finest. Doing cartwheels on this FLOAT! I want one!!! Upon our return to the boat, we decided that maybe it wasn’t going to rain. Although it wasn’t really very warm with all the cloud cover, this was our last opportunity to enjoy the water as we would be leaving in the morning. We jumped in for more floating and maybe a bit of bottom cleaning. I love the little interested fishes. With the exception of Bruce’s scare, which left us reflecting upon the possibilities of what might have happened, our stay here in Boca Raton was just lovely. We enjoyed the crowds of boaters from here on the North corner. We were far enough away to be out of the thick of it, yet close enough to see all the goings on. Had we come here during the week, we would have stayed one day to swim and then moved on. This is a beautiful anchorage and one we will put on our list of places to return. Hopefully next time without the drama!